Guys I am not a TS coding guru by any means...still new at it but wanted to share this code if anyone else was interested. Just wrote this code for myself to keep up with JPERL's threads on Market Statistics. 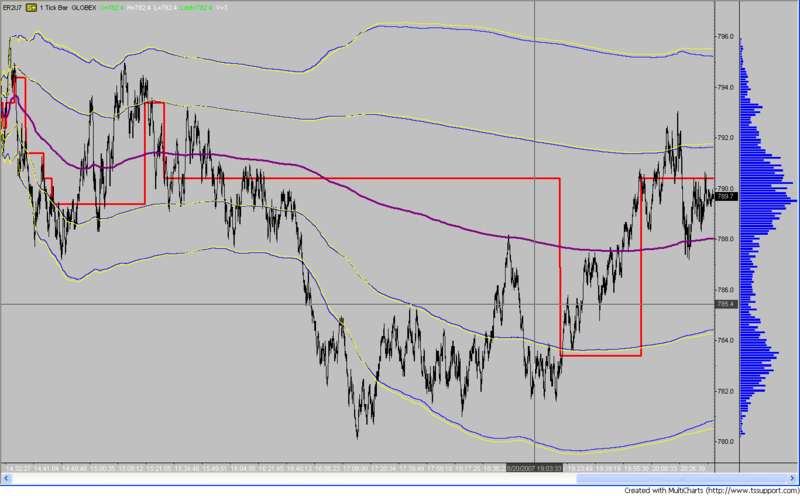 It plots the VWAP, and 1st and 2nd Standard Deviation bands. It lines up with his numbers within a tick or two so I think it is working correctly. Any other TS coders out there please take a look because it can probably be improved upon. This is my first post of a file so if I screwed something up...be gentle! Thank you for posting this. I had always wanted an indicator that provided statistical representation of what was happening today. Nice job! Good post mate. I've been wanting to do this since reading Jpearls threads. I am however using ninja trader, so (if you dont mind) Im going to try and convert your code to ninja script. I dont think there are too many ninja users out there - everybody seems to use esignal or tradestation! I am not sure if the calculation for vi is correct. where (UpTicks+DownTicks) represents volume of the bar ... I think in a probability calculation one should use total volume at price i, not just volume of the bar i. Lets ask Jerry for clarification. You are correct. In the code, ShareW is always the total share volume up to the current time from your start. You divide the volume of the current bar by the total volume and use this "normalized volume" to multiply with according to Jerry. This should be correct if I am understanding the formula correctly. It also seems to line up with Jerry's bands so I think it is correct. Thanks for taking a look at the code if it is incorrect we want to find out now. Thank you for your contribution. If you happen to need any updating on the code, threads here can be edited at anytime so please feel free to do so. Also, would it be possible to add a screenshot of the indicator in action? It would help traders give a visual clue on what the indicator is all about. Thanks. Soultrader...will try to do a screenshot on Monday...everythings at work...good idea. Note that factor vi is volume traded at price pi. If I understand your code, you have used volume of the bar, or volume at time , not as described in the formula. To get proper value for vi, you would have to keep track of all the volume distribution at EACH price level of the range in the array and use the value of volume array element that corresponds to price pi. It can be done, but it would take more then few lines of code, unfortunately. I think it's considered an 'acceptable' trade of computational complexity/speed against accuracy. You can control the accuracy by putting a second series of lower timeframe bars and applying the indicator to that perhaps? (hide the second series). A 1 tick series should be completely accurate? You are exactly correct...I know what you are getting at for sure. Blowfish is exactly right...the code I wrote on a 10M bar will do what you are getting at but only at 10M increments. A 5M bar will be more accurate...then a 3M bar will be even more accurate...then a 2M bar will be even more accurate...etc. Jerry is content using a 2M bar. Technically you would have to run it how you are describing to get it exact but I am not sure that it is necessary according Jerry he thinks running it on a 2M bar is close enough. I understand though what you are saying because if I remember my match classes correctly it is a continuous function not a discrete function? I am approximating (so is Jerry I believe) using calculations at every 2 minutes (discrete) when the true value would be evaluated constantly like a continuous function. We will get more and more accurate as will decrease our bar interval. But knowing that the bands are truly at .38 on the S&P as oppossed to having our numbers 1 to 2 ticks off (I don't know if this is the case but I am just giving an example) I think it is close enough on a 2M according to Jerry. Let me know if I am misunderstanding what you are getting at...the important thing is that the code is doing the same thing as Jerry's code on a 2 minute chart...that was all I was trying to accomplish so I could follow Jerry's logic and trade management. I dont have tradestation so i cant get in to see the code. Could somebody send me the code so I can take a look. I don't want to beat this to death, since the code is performing close enough to what Jerry has. However, it is only important if you decide to expand the code to include volume distribution. At that point you will realize that assumptions made in this code are not valid in all cases. It is accurate observation that the smaller the time frame is, the more accurate calculation becomes, simply because there is an underlying assumption that the volume was constant within the bar interval ( we know the total volume of the bar, and range of the bar). Calculation will be accurate as long as the price does not hit the same level more then once. Now suppose that we have a consolidation day when the price moves back and forth several times thru the range. Every time it comes to the price pi, you will have to add volume of that instance to previous volume at the same price and build volume histogram bar for the price pi. Now when you do calculation for the SD, you would take sum of the volume at price pi and divide it with total volume for the session . I hope that this explanation is better then previous attempts. I hope I didn't mislead anyone. I should have been more clear. The indicator I posted does not give the exact VWAP or SD bands. It most definitely is an approximation. I am only trying to create the identical indicator Jerry uses on his 2min charts for TS users. It should be the exact way that Jerry told us to caculate it. That is all I am trying to accomplish. He said to take the open/hi/low/close and divide by 4, for the price bar...that in itself already throws some level of accuracy out the window. However I am normalizing the volume according to the way he said to do it I think. I would like people to check the code for accuracy according to the way Jerry does it...not for exact accuracy of VWAP and SD bands...I already know it is not to that level of accuracy. Hopefully everyone is clear on what the indicator is doing now. But I agree with you it is not accurate the way you are talking about...that was not my intention. My intention was to create Jerry's indicator for TS users. I have the screenshot. Can you point me to the instructions on how to add the image to the eld? You should be able to edit your first post and then edit the attachment manager. Pm me if you are still having problems. 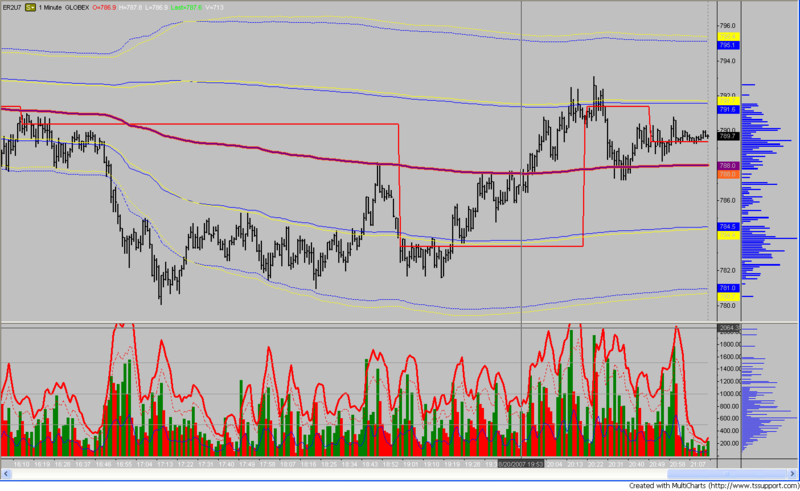 I have coded the VWAP, SD bands and PVP on a tick by tick basis on a 1 Tick chart. I was thinking I could simply hide the 1 tick chart and plot the indicators on a 2 minute chart and everything would be cool...problem is that it gives me an error "Tick and Volume intervals cannot be used in a mult-symbol chart". Does anyone know of a way around this to plot the data gathered from the 1Tick to plot on a minute chart? There has to be a way around this. Maybe creating a function and access...I don't know just thinking out loud...like I said I am new to the functionality of TS and need help. I will post for all TS users for free if we can get this thing figured out. Any help is appreciated. This should be the fix that NICK was pointing out for accuracy in the indicator thread. You would put the 1 tick series on the chart add the indicator on that series then, then hide the initial 1 tick series. Simply add a second 2 5 10 15 minute data series of the same instrument (whatever you want to trade from) to the chart. PPS. Great work!! Thanks you (if I had not already thanked you). 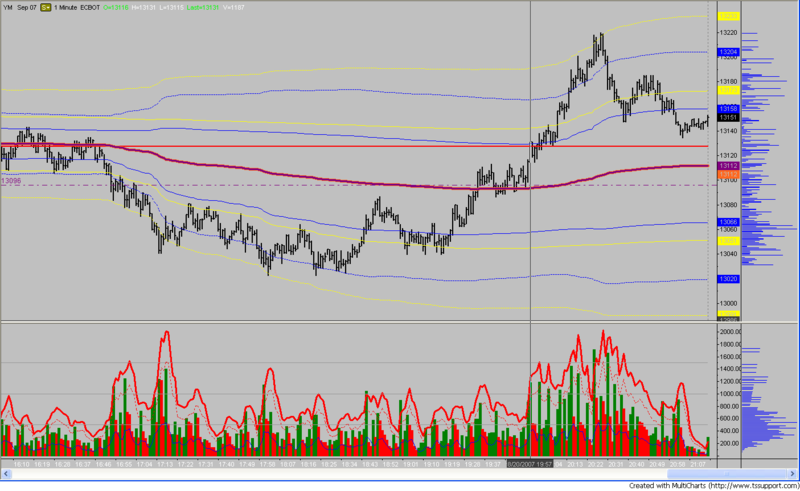 That doesn't work on Tradestation as you can't mix and match tick and minute data series on the same chart. Try ADE (all data anywhere) as a workaround. You'll find more info about it in the Tradestation.com forums. Ahh Ok my bad... I havent used TS for a while. Does it support second based bars yet? A second I think would be a more than adequate sample frequency. Does anyone here use Amibroker for their charts? The programming language seems very flexible, I just wish I knew how to program! If someone could convert these for that program I would be eternally grateful. 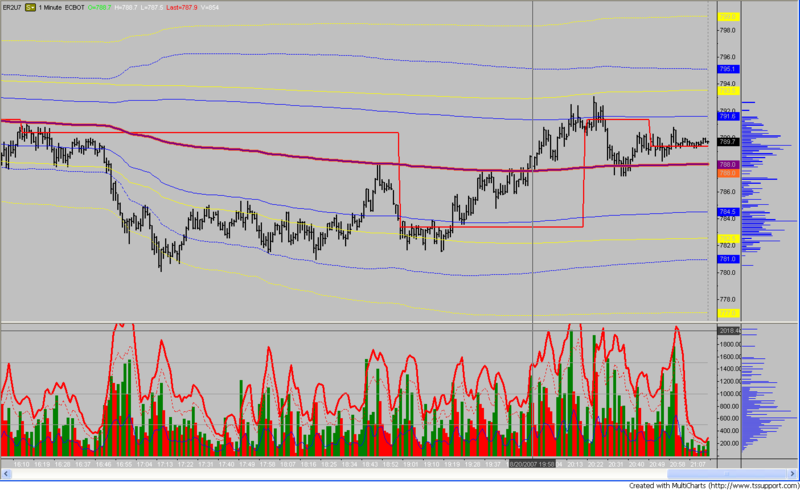 Specifically the standard deviations for the VWAP. Thanks! Thanks Cooter and Blowfish for your help...finally got ADE working and I can see the PVP on my minute charts with the VWAP and SD bands...appreciate the knowledge on this board! Testing it out now for a few days. Could someone tell me which of these SD bands look correct (yellow or blue). Actually I cant work out why they differ as the actual formula I use is the same in both, I just am summing the bars slightly differently. OK figured out what was wrong with the last two indicators but have come up with something that I think is OK. The reason for this is that there are some performance issues with the indicator here as it has to scan the series back to the days start when there is a new tick. Applying it to a tick chart (especially at the end of the day) it slows right down. Anyway I figured there should be a way to do it using running statistics and indeed there is. There is a side benefit to doing it this way as you don't get cumulative rounding errors (according to the signal processing guys). This does not get rid of the sampling inaccuracy that Nick mentions earlier in the thread. I'd welcome comments? I wonder if rounding errors would explain the 2 or 3 ticks difference? One last chart a 1 tick of the same period as the last post (yesterdays ER2). Looks good to me? It is much much quicker this way and its plausible to run it on 1 tick charts (meaning complete accuracy is attainable if desired). If it looks good enough I'll upload it. Blowfish, can you post this? That last chart looks very nice.